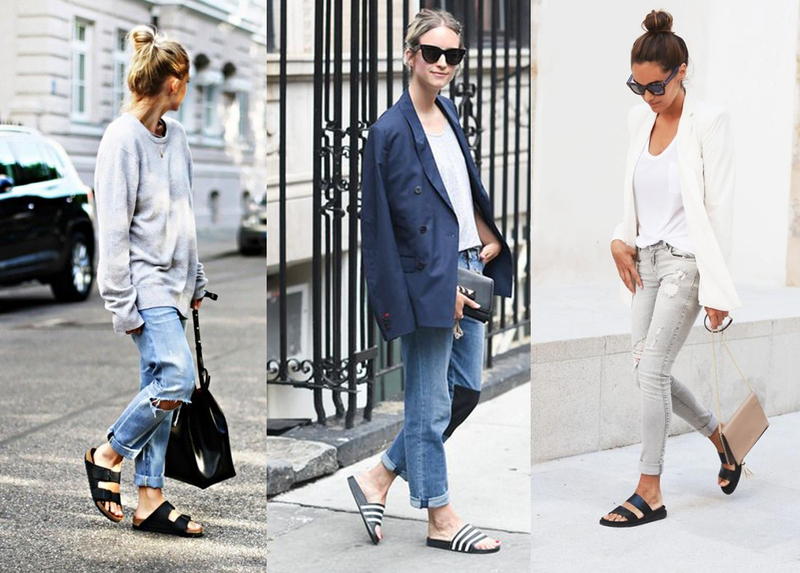 We welcome the Birkenstock revival with open arms! These incredibly comfortable slip-on’s will be your greatest festival accessory. With a nubuck leather footbed that literally molds to the shape of your foot, these German made shoes will provide you with effortless festival style. Ply yourself with plenty of accessories, printed dresses and fringed throw-overs to get you through the summer months. Streamline to standout in a pair of classic black slides. Mix, match and clash with contrasting black and white apparel for instant street-style appeal. Add layers and textures with draped kimono style jackets, tapered trousers or pleated midi skirts. Go crazy with texturised fabric, metallic accents, pastel tones and animal print for style that’s anything but basic. 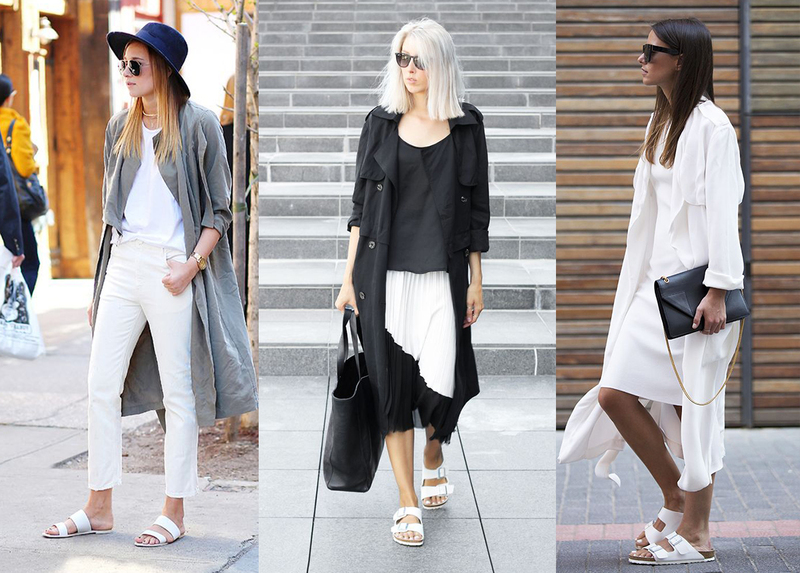 Pack a punch in pristine white slides that will make your sun-kissed pins standout this summer. Keep this look fresh and cool with loose fitting dresses, lightweight trench coats and denim. Indulge in monochrome styling, contrasting stripes and leather accessories. These subliminal white slides are the epitome of summer luxury. 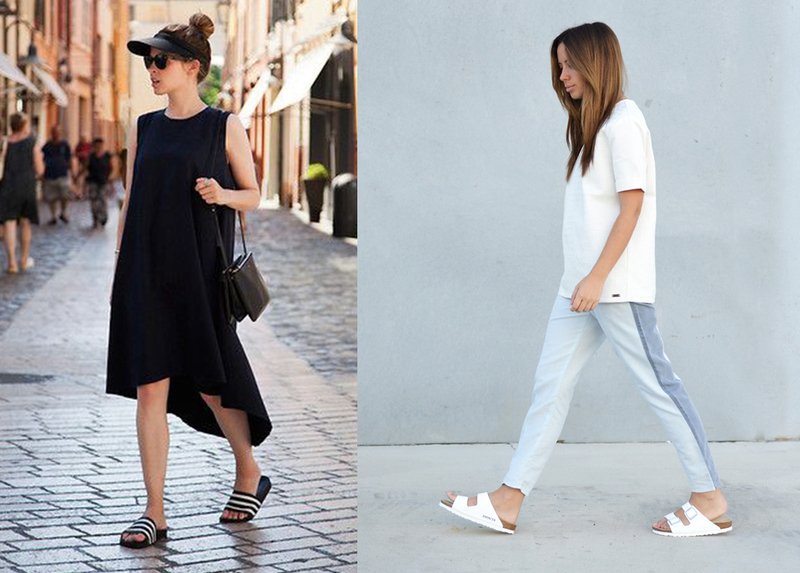 Boys have been wearing pool slides for years, but this season sporty slides have taken on a whole new meaning! These casual pool slides descend from the 1990’s but are made fashionably relevant with a combination of sporty aesthetics and chic attire. Slim lined dresses, mini skirts and jumpsuits are great ways of channeling femininity but remaining enviably comfy. Shoes can slide on over, the humble slide will become your casual summer shoe of choice. Get simple and functional style by pairing your distressed boyfriend jeans and tee shirt with some chunky double buckle slides. Take it easy and team with your favourite denim, baggy jersey and a wide brim sunhat. When in doubt, wear denim!